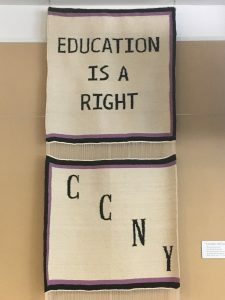 Just got home from teaching at City College, where I work with public school teachers developing their pedagogical practice and scholarship as grad students in the City University of New York, arguably the oldest public university system in the country (rivaled only by the University of California). I am a teaching fellow in the same system, and teach at City in exchange for my ability to do a PhD at no cost. A rare thing to consider, nowadays: that education be considered something everyone should have a right to. Education is becoming increasingly commodified, rarified, costly, and competitive. This gets me down when I think about the pressure in the 21st century to value education solely as job preparation, not as a space for creativity, exploration, political inquiry, and inspiration. A banner on the wall at City reminded me that this was not always the case, at least not in New York City. Here’s hoping the city that never sleeps continues to inspire and excite the imagination of the rest of the country.